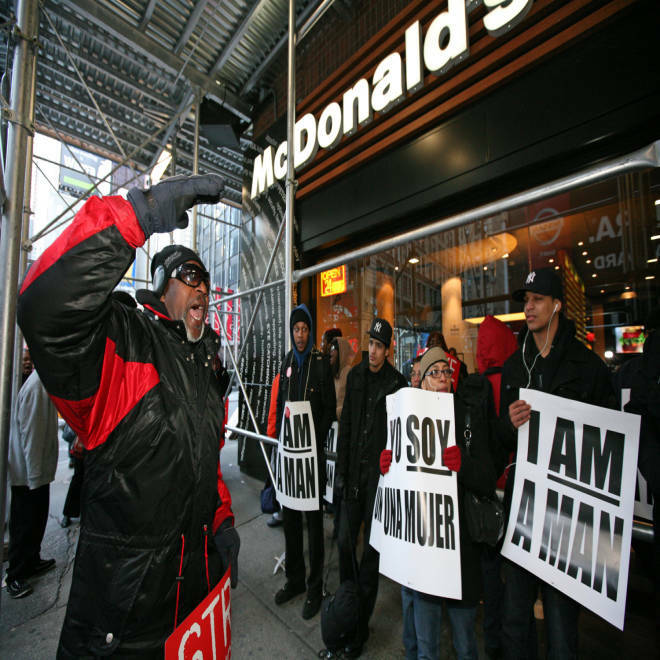 Fast food workers and supporters picket outside a McDonald's restaurant Thursday, April 4, 2013, in Midtown Manhattan. They work for some of the biggest businesses in the United States, yet they are among the country's lowest-paid workers. On Thursday, fast-food workers staged walkouts at McDonald's, Burger King, Taco Bell and other restaurants in New York City to call attention to their plight. Organizers scheduled the job actions to commemorate the day Rev. Dr. Martin Luther King Jr. was assassinated 45 years ago in Memphis, where he was supporting a strike by sanitation workers. 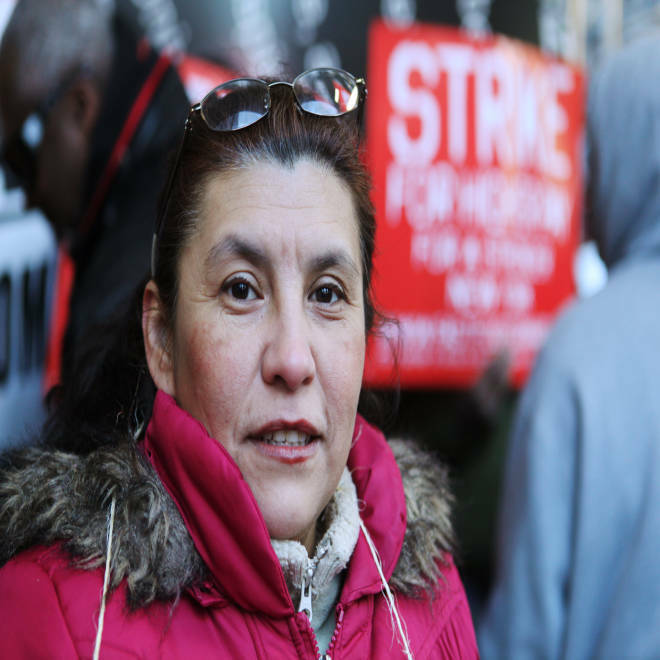 "It's not enough," Elba Godoy, a crew member at a McDonald's just a few blocks from Times Square, said of her $7.25-per-hour minimum wage, which helps support her extended family of seven. "They don't like [that we're out here], but we have to do it. We cannot survive on $7.25." Godoy and her colleagues are seeking a raise to $15 an hour and the right to form a union without retaliation. The walkout is part of a national movement by low-wage workers to raise wages and gain rights. Higher-wage occupations constituted 19 percent of recession job losses, and 20 percent of recovery growth. In the fast food industry, NELP says, the big names have weathered the recession, and they are seeing solid profits and passing them along to top executives and shareholders, but not to their lowest-paid workers. Fast food and other low-wage workers often qualify for food stamps and other public assistance, meaning that taxpayers subsidize their wages. "We cannot survive on $7.25," says Elba Godoy, a McDonald's worker. The low-wage trend is expected to continue; the government estimates that six out of the top 10 growing occupations over the next decade will be in relatively low-wage, low-skill jobs. In a statement, McDonald's said the company and its franchises "work hard every day to treat McDonald's employees with dignity and respect. Employees are paid competitive wages and have access to a range of benefits to meet their individual needs." "In addition," the company said, "employees who want to go from crew to management can take advantage of a variety of training and professional development opportunities." Michael Saltsman, research director at the free market-leaning Employment Policies Institute, says that by demanding $15 an hour, these employees are hastening their own demise. “The workers aren’t in a fight with management,” he said, “they’re in a fight with technology.” At some point, he said, “the cost of service is going to get trumped by the customers’ demand for lower prices,” and people will be replaced by less expensive machines, like a burger-making robot being marketed by a San Francisco company. For those looking to climb the wage ladder, a recent government report contained some sobering news: some of the most numerous and available jobs in America are also its lowest-paying. Topping the list of most common jobs is retail salespeople, followed by cashiers, and, in third place, food service workers. There are more than 2.9 million of those folks, and they earn the lowest median wage in America: $8.78 an hour, for an average annual wage of $18,720 per year -- if, that is, they work full-time. That amount is just above the poverty line for a family of three; below the line for a family of four or more. 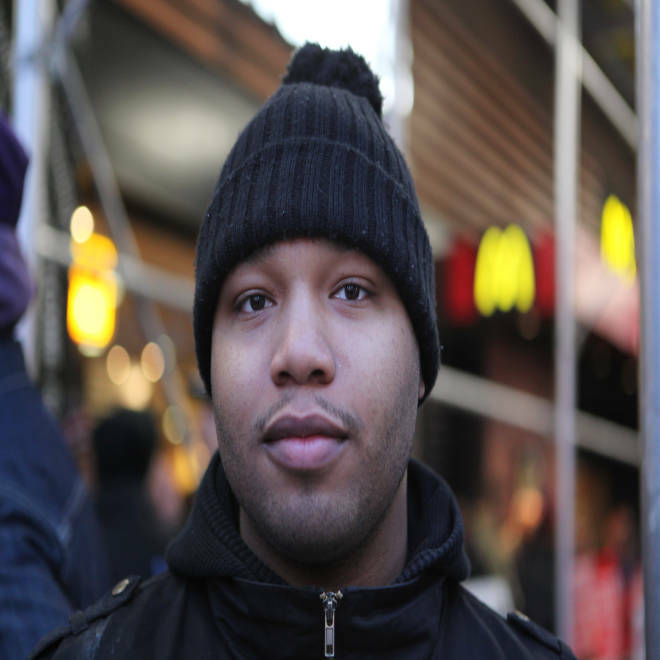 "Enough’s enough," said 24-year-old Alterique Hall, one of Godoy's co-workers. "Low-paid workers are sick and tired of being sick and tired at the end of the day. We get a pat on the back saying, ‘You’ll be fine, you’ll make it somehow."" He says he can't make ends meet on the $8-per-hour he's paid, and often relies on his grandmother and aunt for meals. "Help us get a job at your office," he said, gesturing to the army of white collar workers scurrying to their high-rise buildings. Alterique Hall says he can't make ends meet on the $8-per-hour he's paid, and often relies on his grandmother and aunt for meals.